草木犀 Melilotus officinalis (L.) Pall. 豆科 Leguminosae | | 草木犀属 Melilotus | | 草木犀 Melilotus officinalis (L.) Pall. 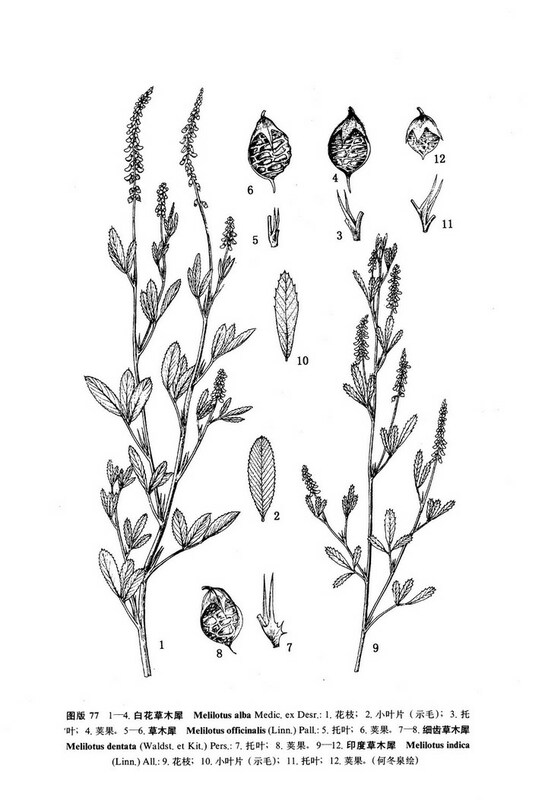 Melilotus officinalis (Linn.) Pall. Reise 3: 537. 1776; Desr. in Lam. Encycl. Meth. 4: 62. 1797; Ledeb. Fl. Ross. 1: 537. 1842; Baker in Hook. f. Fl. Brit. Ind. 2: 89. 1876; Bobrov in Kom. Fl. URSS 11: 180. 1945; 中国主要植物图说•豆科201. 1955; Hausen in Tutin et al. Fl. Europ. 2: 149. 1968; Ali in Nasir et Ali, Fl. W. Pakistan 100: 309. 1977.——Trifolium officinalis Linn. Sp. Pl. 765. 1753.——M. suaveolens Ledeb. in Index Sem. Hort. Dorpat. Suppl. 2: 5. 1824, et op. cit. 536. 1842; Baker, op. cit. 89. 1876; Bobrov. l. c. 180. 1945; 中国主要植物图说. 豆科203.1955; Ohwi, Fl. Jap. 817. 1975; 西藏植物志2: 735. 1985.——M. graveolens Bunge, Mem. Acad. Petersb. 6: 90. 1835; Franch. Pl. David. 1: 81. 1884.——M. officinalis (Linn.) Pall. f. suaveolens (Ledeb.) Ohashi ＆ Tateishi in Sci. Rep. Tohoku Univ. ser. 4, 38: 320. 1984.